When you hear the phrase "he tore the cover off the ball," you think about a blistering line drive or a towering home run. In the sixth inning of Milwaukee's 5-3 win over the Pirates, Brewers backup catcher Martín Maldonado literally tore the cover off the ball and it never made it out of the infield. —but throwing this baseball with a comet's tail. That glance down kills me. It looks like about mid-throw he realized what he just saw seconds before and it borked up his whole rhythm. The cover probably added some extra drag and slowed the ball down, too. 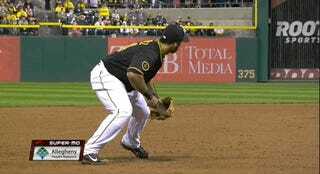 It obviously never made it to first and Maldonado was safely on base. After the game, he discussed his brush with hyperbole. Yes, beating out a flying squirrel for a base hit is definitely kind of weird.